super-powered characters of the 1960s. By the middle of the decade, they were creating entire communities of such characters for Marvel Comics. In their first stab at it, X-Men (1963) the community of mutants was physically dispersed, and just beginning to develop ties among its members. But with The Inhumans (1965), they created an established community, with a sense of group identity going back hundreds of generations. What the two had in common was that each member of the community had a super power different from any of the others, thus appealing to superhero fans, who tend to think of such characters more in terms of their extraordinary abilities than more subtle features of their personas. Another aspect of The Inhumans which appealed to that audience was that each wore the same distinctive costume day after day, making them look more like a full-time superhero team than a culture full of people with rounded lives. Over the next few decades, these elements were also incorporated into The Eternals, Strikeforce Morituri and other series that involved large and inexactly-defined groups of super-powered individuals. The first of The Inhumans to appear was Madame Medusa (who later dropped the honorific, and became simply Medusa), whose super power was prehensile hair. She debuted in Fantastic Four #36 (March, 1965) by being recruited into The Frightful Four. This was a group of villains, the other three of which were already established — The Wizard and Paste Pot Pete in The Human Torch's series and The Sandman (no relation) in Spider-Man's. Medusa seemed to have come from nowhere. A few months later, as her relatives were being introduced (45th issue, December 1965, tho one of them, Gorgon, turned up a month earlier), she turned out not to have been as bad as the others. These relatives included Black Bolt (their ruler, who could flatten anything by speaking aloud, but couldn't talk normally), Triton (a seafaring superhero like Aquaman except green and scaly), Karnak (generic super powers such as strength and speed, plus an ability to zero in on the weak spot of whatever he wants to smash), Crystal (who could control weather, and who wound up married to Quicksilver, one of The Avengers), and quite a few others. Together, they constituted a race of human-like beings who secretly share the world with ordinary people, just like The Sub-Mariner's Atlanteans and Tigra's Cat People. The Inhumans came to be about 25,000 years ago, when The Kree (the alien species to which Marvel's first Captain Marvel belonged) started doing genetic experiments on Earth people. The Kree don't seem to have gotten much out of these experiments, but a century or so later, the test subjects had advanced to the point where they were experimenting on themselves. They got their super powers and other mutations through the self-inflicted "Terrigen Mists", a chemical treatment one of them devised early on. After a few millennia wandering here and there in Eurasia, they settled on an island in the Atlantic called Attilan, where they mostly remained isolated until being incorporated into the Marvel Universe. During the latter part of the 1960s, the company found them useful as an occasional source of super-beings, for example when Invisible Girl took a pregnancy leave from The Fantastic Four in 1968, and Crystal temporarily took her place. 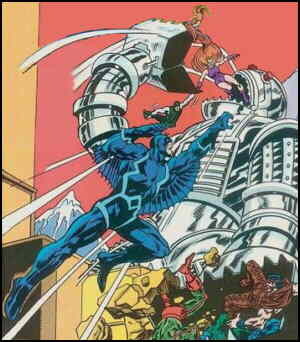 They had their own series, briefly at least, in the back pages of Thor's comic, but never appeared on the cover there. In 1970 they got a more prominent one, sharing the start-up title Amazing Adventures with The Black Widow. It lasted only a couple of years, but in 1975 they got their own comic, which ran until 1977. Since then, there have been mini-series and specials here and there, as well as numerous guest appearances by one or more of them, throughout the Marvel line. Text ©2004-2010 Donald D. Markstein. Art © Marvel Comics.